First start heating milk in a heavy bottomed vessel, grease the bottom of the pan with few drops of ghee. (this is to prevent burning of milk at the bottom). Take 2 tablespoons of warm milk and keep saffron soaked till needed. Boil milk for 20-30 minutes in very low flame. Keep stirring now and then. When the volume reduces almost half,add the saffron soaked in the milk,evaporated filled milk and boil for 2 more minutes. Chop the nuts and fry it in ghee till golden brown and add it to the milk too,add the sugar and simmer for few minutes. (Is this is called rabri/rabdi)?. Squeeze the sugar syrup from the rasgullas,take care you don’t squeeze the rasgullas hardly(this will make the rasgulla break),just squeeze it gently. Add it to the milk when it is still hot. Let it get soaked. After cooled down,refrigerate and serve cold. Do not add more than the mentioned evaporated milk as it will turn the rabri look ugly in colour. Also too much of saffron will spoil the taste,make sure you add just a few strands. Keep refrigerated and tastes best when served cold…. If the rasmalai turns too thick, later you can add little milk to dilute it. Thick boiled milk with the caramelized smell of the evaporated milk + the saffron when combined, is the meaning of divine smell! Delicious!! The rasgullas dunked becomes soft and combines well with the rabri! Wow! 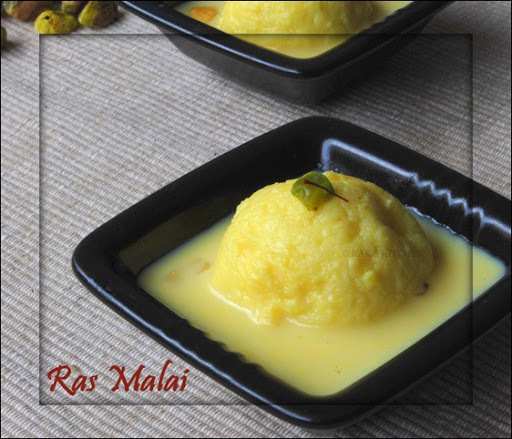 Raji I'm drooling..very beautiful clicks..
Woww Raji congrats on ur 3rd blog anniversary, very irresistible rasmalai..
looks yum and so easy to make. thats exactly how I also make it. but am drooling and drooling right now. Congrats for the 3rd anniversary! rasmalai looks great! Happy blogging! I too make this easy breazy one… Yum! Gorgeous rasmalai to celebrate the occasion. Congrats Raji..3 years is a big milestone. Wish you many more to come. congrats and lovely, yummy dish and a easy breezy recipe!! Wow what a visual treat. I would love to have some and Congrats on ur 3rd blog anniversary..may u achieve many more is my prayer. I make rasmalais using this method too and love it. The first time i tried this though, i didn't squeeze out the sugar syrup and it was such a flop. Looks so good Raks. Most importantly – Happy Blog Anniversary! Congratulations on your blogs 3rd anniversary. I am too fond of rasgullas and rasmalai and your clicks are stunning! Oooh my favorite dessert, love it! Nice clicks. Congrats on your 3rd blog Anniversary. Rasmalai looks mouthwatering. Perfect sweet to celebrate with. Congrats…this looks yummy and looks so delicious! !beautiful click!! Congrats on your 3rd blog anniversary. Rasmalai looks delicious. Nice clicks. Congrats on your milestone dear..perfect rasmalai to celebrate the occasion..I wish you good luck for everything and many more such milestones ahead..keep rocking gal!! Congrats on the milestone and what a delightful way to celebrate it. Congrats on your third blog anniversary!!! Very delicious and mouth watering rasmalai! Photograph is beautiful! 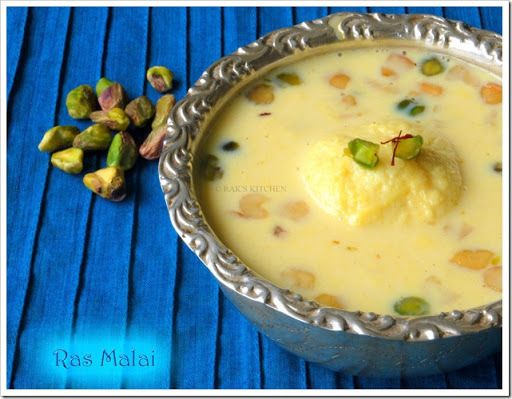 Love the pictures and the Rasmalai is very yummy! Raji,Wishing you a very happy Blog anniversary and the prefect dish to celebrate this joyous occasion! From the picture I can imagine how yummy it would have tasted. Lovely clicks. I used to make this in India, but after I tasted the rasmalai my friend made I have stopped make it out of rasagulla's.I just eat them as such. Smiles. But this is a very good way to make rasmalai though. thanks for reminding me of this recipe. wow!!! wow!!! so perfect dear…picsmaking me drool!!! This is my first fav sweet in my dessert or sweet list… Looks super good and tempting raji. Congrats on ur blogs anniversary !!! Keep going and as usual wonderful pictures and beautiful post. Congrats on your milestone! I like this semi-homemade recipe! Drool-worthy Rasmalai! liked the idea of using rasgullas..
yummmmmo 🙂 supera iruku paaka. i have an easy method for this too. haven't made it in ages though..
Hi can I use Half and Half in place of evaporated filled milk ???? Where every you find condensed milk, it will be next to it. i read ur rasmalai recipe. it looks easy but i didnt understand the term evaporated filled milk. can u tell me? Its thick reduced milk, without any sweet. It will be there found near where they keep condensed milk in the shops. I am not sure why you faced this problem, but next time make sure to washthe chenna well and knead properly. Hope it works. Hey raks,happy anniversary for your blog.Rasmalai was awesome. Its looking so good. but how can we prepare evaporated filled milk at home?? Its nothing but thick reduced milk. Hi, i've kept my homemade paneer ready and searching for rasgulla recipes. I saw urs and will make them tomo. i'm wondering and replying that even after 3 yrs of this post u get so many questions and u reply them without fail! Hats off!! Looking Good…. simple too..for a taste check?? What if I do not have evaporated milk? Can I replace it with condensed milk? If I do will it not be too thick to b absorbed in d rasgulla? If you do not have evaporated milk, condensed milk can also be added, but add sugar very very less. 2&1/2 cup means hw many lts of milk???? I tried it… It came very tasty and yummy…… Everybody at my home likes it…… Thanks to the raks kitchen……. Hi, I would like to try making this recipe although I am little confuse after reading the comments. Someone mentioned about pressure cooker although there is nothing I read about pressure cooker in the recipe. Am I missing anything? What is the shelf-life for this? For a party the next day, can I make it the day before and keep it in the fridge? Luks cool �� I used to boil milk and add MTR bad am drink mix to it for making rabri. I think even the readymade bad am drink can from MTR will work good. Hi Raji, how did u chop the nuts? ?